Issued in the year that Great Britian annexed New Zealand. 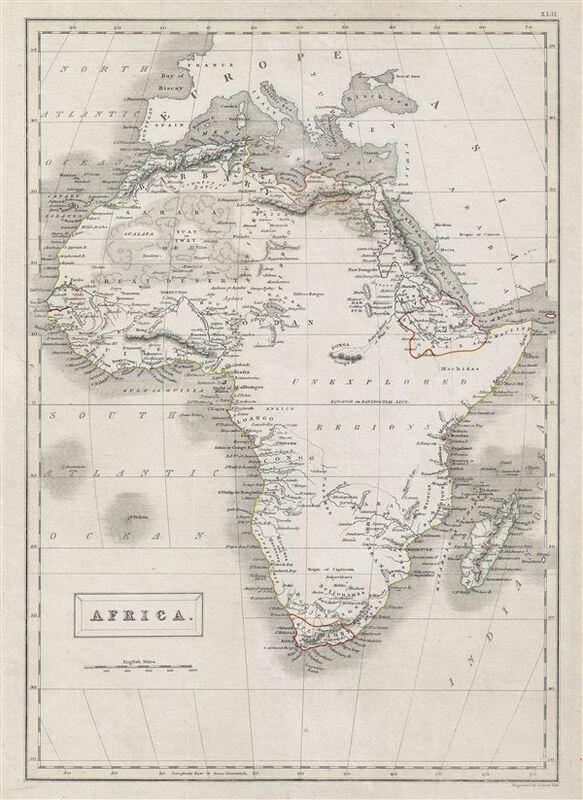 A fine example of Adam and Charles Black's 1840 map of Africa. The map covers the entire continent from the Mediterranean Sea to the Indian Ocean and the South Atlantic Ocean. Also shows the Island of Madagascar. An interesting map issued just as most of the earth's non-polar shore has been explored. Gone are many of the errors of the previous century with the coastal regions accurately depicted. Inland though, much remained confused. A large portion of central Africa is marked ‘unexplored regions' and the area of the Sahara or the Great Desert is beautifully rendered. This map was engraved by G. Aikman for issue in the 1840 edition of Black's General Atlas. Very good. Blank on verso. Original platemark visible. Erased pencil mark in left center border.